rom exploring the spiritual side of Fiesta at the Santa Barbara Mission to watching the annual children's parade to devouring Mexican food and inordinate amounts of beer, everyone has a different way of celebrating Santa Barbara's Spanish heritage. 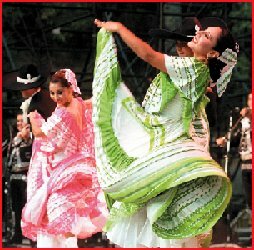 Fiesta Peque�a, which means "Little Fiesta," is the official opening event. About 2,000 to 3,000 people usually attend Fiesta Peque�a, which Channel 3 will broadcast live. The free event, which features dancing, music and short talks, starts at 7 p.m., July 30 at the Mission and will last about an hour and a half. Viewers should bring folding chairs on account of the limited number of seats. "We get together as a predecessor to Fiesta and ask God's blessing," said the Mission's Father Virgil Cordano, who has been on the Fiesta board since 1961. The next day, the Mission will be the site of La Misa del Presidente, a Catholic Mass honoring Fiesta's presidente. Participants are encouraged to attend the 10 a.m. Mass in costume. A garden reception follows. Both the events will focus on the spiritual side of Fiesta  and not just the rampant partying most people associate it with, Cordano said. "I'll give a talk  something meaningful about Fiesta and the history of the Mission," he said. "It (La Misa del Presidente) is about placing the Mission in the context of gratitude toward God for the blessings that have come to Santa Barbara over the years." Before Fiesta even gets started, eager partygoers can catch a glimpse of events to come at La Fiesta del Presidente, "The President's Party." The celebration honors Michael Danley, this year's El Presidente. The event is slated for 5-10 p.m., July 27 at El Paseo Restaurant in the El Paseo shopping center. Song, food and dance will be featured. To get tickets, call the Arlington Ticket Agency at 963-4408. El Celebraci�n de los Dignatarios, or "Celebration of the Dignitaries" is guaranteed to bring out the animal in Fiesteros. Partygoers will have a chance to mingle with the mayor, members of the City Council and a menagerie of wildlife at the Santa Barbara Zoo. The zoo party features music, dancing and the food of 12 local restaurants. El Celebraci�n del los Dignatarios is set for 5 p.m. to 8 p.m. July 31 at the zoo's garden. Tickets cost $18 and can be purchased at the Arlington Ticket Agency. The next day, El Desfile Hist�rico, the Old Spanish Days parade, will stake claim to the west end of Cabrillo Boulevard and proceed east past the official reviewing stand and reserved seats to State Street via the underpass. Then the parade heads north up State Street from the beach to Sola Street. Immediately after the parade, the Horsemen's Rendezvous at the Covarrubias Adobe and a post-parade garden party will begin. The garden party will take place from 2:30 p.m. to 4:30 p.m. at Home Savings of America at State and Micheltorena streets, and will feature refreshments and mariachis, as well as float awards and trophies. Cordano said these parties serve an important purpose in the community. "Fiesta brings people together that otherwise would get together," Cordano said. "They get together to find reasons to celebrate and be happy."